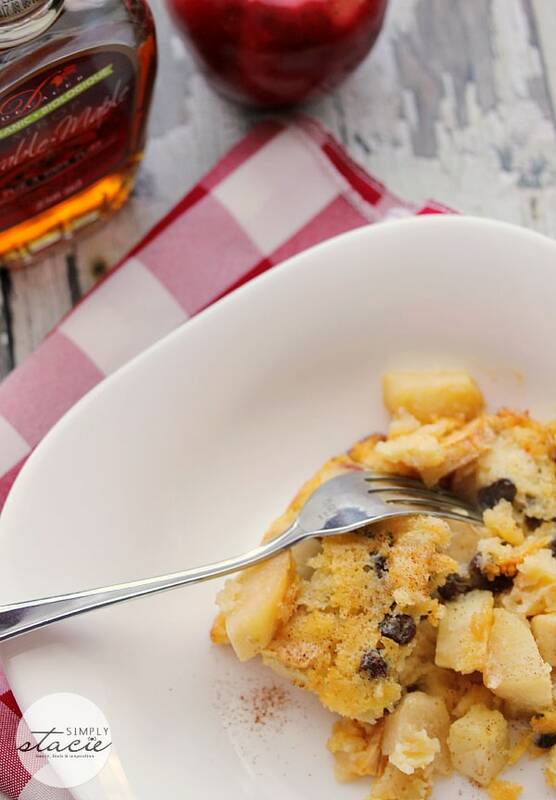 When I think fall desserts, there are two ingredients that immediately pop into my head. Can you guess what they are? I know it’s not hard- pumpkins (of course!) and apples. You’ve probably been seeing an explosion of recipes for both on Pinterest. I normally make Apple Crisp, but this year I wanted to try something a little different. I had a recipe clipping from an old Chatelaine magazine that I’ve been wanting to try for years. I had some Red Delicious apples on hand so I figured I’d give it a whirl! I know Red Delicious isn’t traditionally used in baking, but I improvised. Thankfully, it turned out delicious! 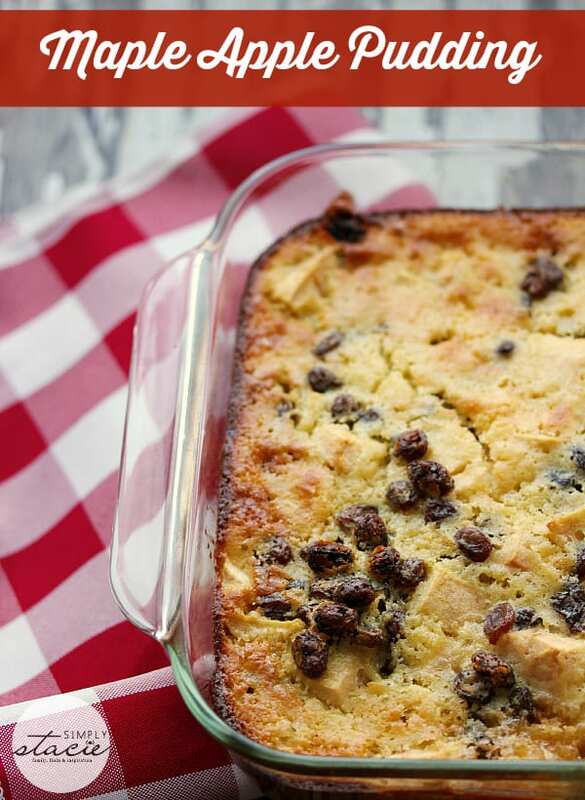 This recipe is more like a bread pudding and John said it reminded him of those boxes of Sauce N’ Cake. Only he said the homemade version is a million times better. Thanks John. I thought so too. The only thing I was missing from my recipe was some vanilla ice cream! I bet it would have been delicious topped with a scoop. Now this is what I call a scrumptious fall dessert. I’ll be making this one again, but think I’ll use Granny Smith apples next time since I have a bunch in my fridge right now! For more apple recipes, check out my friends’ posts: Oven-Dried Cinnamon Apple Rings, Maple Apple Crisp and Baked Apples. 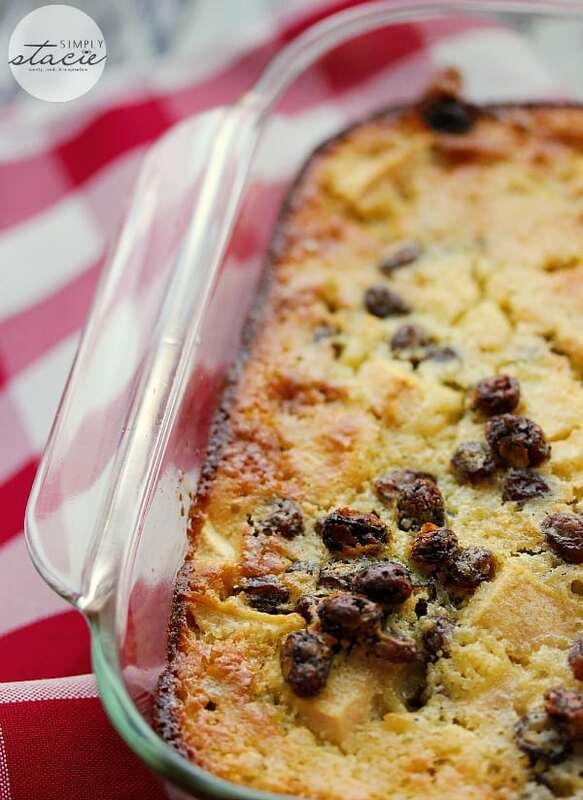 A delicious fall dessert made with apples, raisins and of course, maple syrup! Preheat oven to 375F. Grease an 8 inch square baking pan and spread apples on the bottom. Pour 1/2 cup maple syrup over top of the apples. In a bowl, whisk together the eggs, butter, lemon juice, remainder of maple syrup and milk. In another bowl, stir together the flour, baking powder and salt. Stir flour mixture into egg mixture until fully combined and smooth. Stir in raisins and cinnamon. Pour batter over the apples as evenly as you can. Bake for about 30 minutes or until apples are cooked and top is golden. This recipe looks scrumptious and moist. Don’t forget the cool whip! Yum! I’m always on the look out for new apple recipes and this looks delicious! 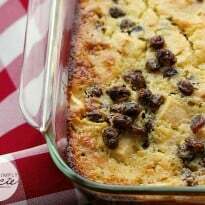 I love maple and I love bread pudding, I think I know what I’m going to do with the leftover apples in my fruit bowl 🙂 Pinning! I bet this smells absolutely amazing baking up. 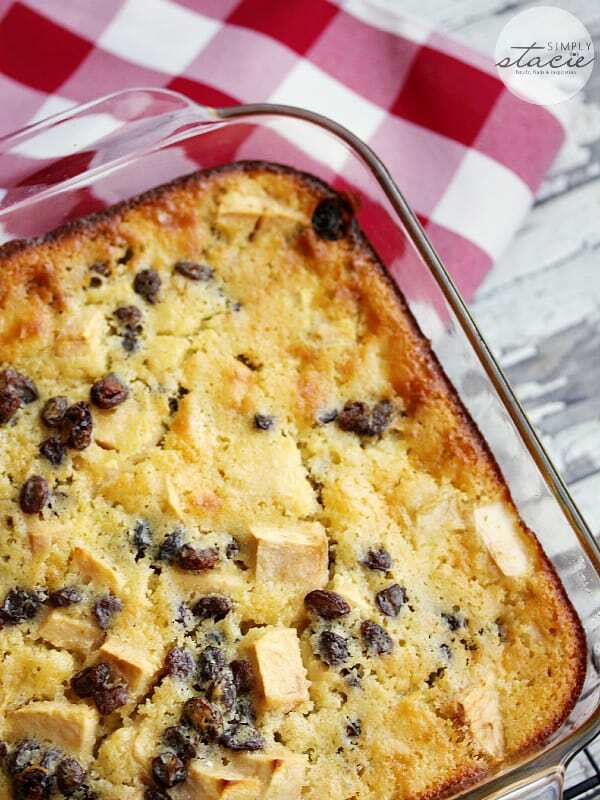 Love this idea for a bread pudding. I’ve never had one with apples in it. I remember tapping Maple Trees in New Brunswick and sampling with pancakes in the afternoon. True to form, my 10 year old son Evan loves maple as much as I do. Each Christmas his grandmother sends a bottle of pure maple from the Nova Scotia tourism shop – annual Christmas sock item. 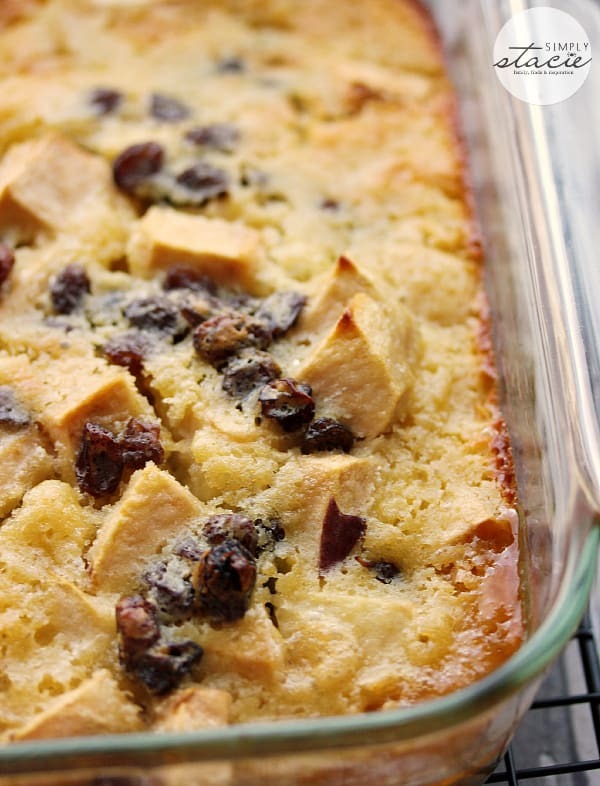 Haven’t had bread pudding in years – I am inspired. In desperate need of comfort food – this looks delicious – excited to try the recipe. Thanks. I know that I’d love this – maple syrup is my thing 🙂 Now why have I never thought of doing this? This looks really amazing and I’m going to have to try it for breakfast very soon! This look really good! Thanks for sharing! I am making this! I love the maple syrup and apple combo! Looks delicious! I have been wondering what to make with all those apples we picked. Will have to give this a try. Thanks for the recipe. Looks interesting. I would give it a try. I love trying new things. Just what I’m craving right now! I’ll be making this for dessert tomorrow!